Considering I was the child who spent hours banging at the basement paneling in my parents' house, hoping to find a hidden spring that would unlock a hitherto-undiscovered chamber, I would have adored Nina Bawden's The Secret Passage. A number of themes in this children's novel are old-fashioned enough that they wouldn't have been amiss in an E. Nesbit classic like The Railway Children—a trio of youths who've lost a parent, a forced relocation to somewhere exotic and strange, the titular secret passage, a number of adults who need the children's intervention to set things right, a lost child, and even a runaway princess of sorts. Bawden's considerable skill turns all these somewhat hoary tropes on their head. The exotic location is dreary London, while the children's original home is an Africa to which they've become thoroughly acculturated. The secret passage itself isn't much of a secret; it's simply behind a door. The lost child isn't lost—at least not in the way the children think. And the princesse lointaine is one of the most unapologetically disagreeable brats in literature. It's Bawden's playfulness with these vintage themes, and her willingness to be either humorous or sentimental in equal parts, that makes The Secret Passage a fun read . . . even for an adult like myself, who never quite got over the urge to rap on paneling, hoping to hear a hollow sound beyond. Synopsis:The House of Secrets was written by Nina Bawden and was published in 1963 in England under the title The Secret Passage. The novel follows three siblings who have to move to Enlgland to live with their Aunt Mabel after their mother dies. Aunt Mabel lives in a boarding house and while living there, the children discover a secret passageway leading to the big house next door. This discovery leads them to discover a few different secrets.Storyline:The storyline was really simple and I did not find it particularly interesting or engaging.Setting:The House of Secrets is set in England in a boarding house and the house next door to that. The setting was ok, but not exactly great.Characters:The characters were pretty good. The book is short, so I didn’t feel like I got to know the characters really well, although they were all quite good and quirky. My favorite character was the youngest of the three siblings , a little boy named Ben.Did I Like It? : I sort of liked it I guess. This book was just ok for me. It was a cute and easy read, but there wasn’t anything special about it. I read this book when I was kid, so this was a reread for me. I didn’t remember it at all though, so there wasn’t really any nostalgia.Do I Recommend It? :Not really, at least not to adults. I feel like this is a children’s novel that is truly best enjoyed by children. I’m pretty sure this book is out of print as well, so it wouldn’t be easy to get anyways. The more work of Bawden’s which I read, the more I am beginning to favour her children’s stories over her adult offerings. The last couple of the latter which I have read have been thoroughly disappointing. 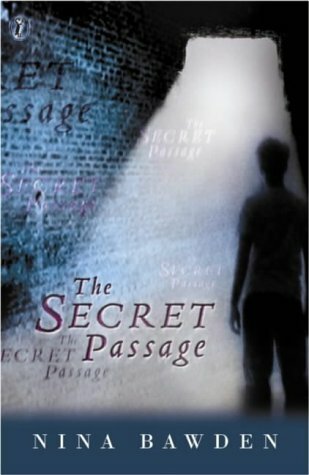 I was a little apprehensive when I began The Secret Passage, but I very much enjoyed it. The story is relatively short (only 155 pages in the lovely old Puffin edition I have), but it is so well written. The relatively simple story – three children living in Africa suddenly have to move to England to live with her aunt after their mother passes away and their father is taken ill – has somehow been rendered unpredictable in terms of what one might expect will happen. It reminded me a little of Tom’s Midnight Garden, The Secret Garden, and Enid Blyton’s mystery stories. A lovely, lovely book which brought a smile to my face, and which is sure to delight even the fussiest young reader. Really enjoyed this children's book from 1963 - but then with 3 children having to move to another country to live with an emotionless aunt, and with an empty house next door to secretly explore, what's not to enjoy? I think I must have read this before -- and either it was very long ago, or I was particularly unwell at the time, because every aspect of this story is something I had already half-constructed into what I thought was an original idea of my own. Nope! Just something forgotten from childhood lurking in my subconscious: a leopard swept away on a tree branch in a flash flood, a huge friendly sculptor named Abe who lives in the garden shed, a lonely aunt with a tragic past in a rickety old boarding house on the English coast. All excellent things.With all children's literature of this era comes a huge warning in flashing lights for the typical sickening gender norms, and also the shockingly casual imperialism. In the best of these novels, the former isn't so prevalent. I think we can say that for "The Secret Passage". Yes, a few lines definitely made me cringe, but overall I found the children to be quite distinct from each other and fleshed out as individuals without resorting too heavily to sexist tropes. Ben in particular stole my heart -- but then again, anyone who pays even the slightest bit of attention to my reading trends will know I love a good stubborn, headstrong, argumentative child protagonist, and Ben just fits that model so perfectly, with the added bonus of being utterly adorable.The imperialism, though. The imperialism. It's staggering how it always manages to rear its ugly head, no matter what I expect going into a story. Often it's India that gets the brush of mysticism and misplaced British nostalgia, but in this story it's Africa. Because don't you know children, Africa is a magical land where mother and father lived in their own special bungalow separate from the mud huts and we children had fourteen servants who doted on us and we never had to lay the table. If only mother hadn't died of dysentery! Honestly, name me one British children's author from 1850-1980 who doesn't big up the Mystical Exotic Lands That Definitely Belong To Us.I'm becoming increasingly aware that when the time comes for reading any of my childhood favourites to my future kids, it'll have to be coupled with a very long and very solemn history lesson. Nina Bawden’s “The House of Secrets”, the same thing as "The secret Passage", kicks off with a trio of children from Kenya who arrive in England, curious of the lives lived there by the seemingly foreign people, which include their Aunt Mabel, with whom they are living with and help in her daily activities. Later, their curiosity leads them into questioning the abandoned house they call the “House of Secrets”. I take interest in this book as it gives the reader a sense of suspense leading up to the next discovery, one after another, with much of it focusing on this ‘House of Secrets’, the seemingly abandoned house next door that the children’s Aunt Mabel had lived in as a child. The house is seen as dark and seemingly untouched in many parts of the house for a large period of time, and offers the reader a very well-drawn mental picture of what it holds. I recommend this book to those who are searching for mystery in a busy setting. Synopsis copied from alibris.com: After their mother dies, siblings John, Mary, and Ben are forced to leave their home in Africa and move in with their Aunt Mabel. As the siblings attempt to adjust to life with their aunt, they befriend their troubled next-door neighbor and find themselves caught up in a dangerous adventure.This is a young adult book I read a year or two ago; it was interesting and well written, enjoyable for an adult. It is an excellent story. It's very intitutive and thoughtful. I love how the author explores the children's personailty. I love the old lady Miss Pin. Also all the delightful characters you meet are well developed. Althought it is a short story it might have been better if it had a stronger ending but otherwise I am looking forward to her other books. 3 1/2 stars. Love the beginning in Kenya, which reminded me that I did so much of my learning about the world from reading novels as a child. Nina Bawden's characters are so fresh and ferocious; I just love them. Her work seems to me so modern, or perhaps timeless is a better descriptor. Nina Bawden - Nina Bawden was a popular British novelist and children's writer. Her mother was a teacher and her father a marine.When World War II broke out she spent the school holidays at a farm in Shropshire along with her mother and her brothers, but lived in Aberdare, Wales, during term time.Bawden attended Somerville College, Oxford, where she gained a degree in Philosophy, Politics and Economics.Her novels include Carrie's War, Peppermint Pig, and The Witch's Daughter. A number of her works have been dramatised by BBC Children's television, and many have been translated into various languages. In 2002 she was badly injured in the Potters Bar rail crash, and her husband Austen Kark was killed.Bawden passed away at her home in London on August 22, 2012.